The 2015 Euromoney FX Survey has just been released, having shown a number of interesting points, including a shakeup in the top five global FX market share by the industry’s leading banks. In particular, Citi managed to cling to the top spot again this year, retaining the largest market share percentage of FX trading (16.11%). Citi edged out Deutsche Bank AG, which came in second with 14.54% market share. Moreover, Barclays was third with 8.11%, while JPMorgan jumps into the top five with 7.65% – UBS finished fifth with a 7.3% market share. 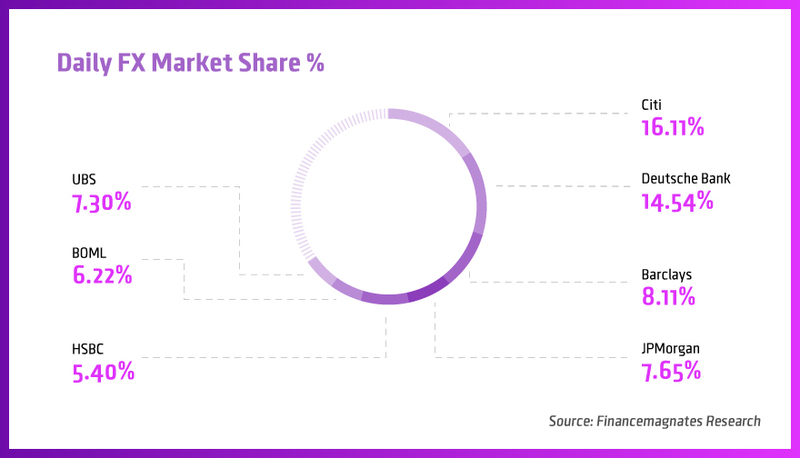 Citi and Deutsche Bank now encompass nearly one-third of all FX market share amongst global banks, making their execution one of the dominant methods for clients. The 2015 Euromoney FX Survey also reported that for the first time, e-trading has surpassed voice trading, which now accounts for 53.2% of client flow. According to Marshall Bailey, President, ACI Financial Markets Association, in a recent statement on the FX Survey’s findings, “The findings from this year’s Euromoney FX Survey make for interesting reading. While the largest FX trading banks continue to play a dominant role, as expected, in the flow of currencies, how this flow is transacted continues to evolve is increasingly becoming an area of interest. “The benefits of transparency as a result of electronic trading are numerous, and technological spend and investment has become a critical feature of modern markets, with trading and regulatory compliance increasingly achieved via electronic systems. Such innovation is good for the market and will help the industry to evolve and learn from the past,” he added. How quickly can a phone order be processed? In an instance like SNBomb, I would think a phone order would have insufficient time to react timely, unless properly staffed. A phone rep can only answer so many calls at once. I’m not saying their shouldn’t be a phone for emergencies, but I can’t see the phone outpacing a redundant, electronic order terminal. Maybe someone can elaborate why there is still nearly 50% of order flow still being processed via phone.